A complete guide on how to reach Positano and Amalfi Coast from Naples. It is more easy than you can expect. There are many opportunities by bus from Naples to Positano and Amalfi Coast, or even by Train and Ferry. If you want avoid the expensive taxi to reach Positano, or a Private transport to the Amalfi Coast, you can still go there with the Public Transport. This guide will help you to understand which is the cheapest way to reach the Amalfi Coast from Napoli detailed by locals. In the middle way between Napoli and Amalfi there is Pompeii. You can book in advance a rouins Tours from Naples to Amalfi Coast and Pompeii. Is the right place to understand how to get from Naples airport to Amalfi Coast. It is also a good itinerary plan from Naples to Amalfi Coast by ferry and so visit the gems from the sea. Write a full guide on how to get to Positano, from Napoli or From Sorrento, was not that easy. The Amalfi Coast is one of the beautifulest places on the Earth. One of the most emotional location, ideal for Honeymooners and Couples, but also for Solo travellers, thanks to the hiking places and the breathtaking landscapes. It was not easy to assemble a proper itinerary guide of the Sorrentino Coast. From Napoli you can reach the Amalfi Coast with the Train, from Molo Beverello to Amalfi by Ferry, or even by bus and it will take longer. There are two way to visit the Amalfi Coast, the better way from the airport is from Naples. 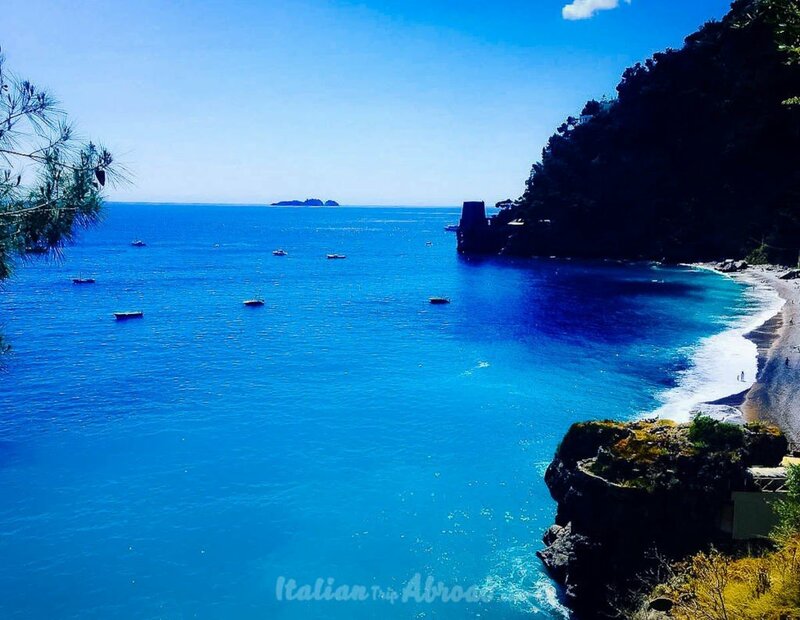 But you can reach the paradisiac coast even from Salerno, doing the opposite way, from Amalfi to Sorrento, passing by Positano and the small gems on the Coast. There are many tours from Naples to Amalfi Coast, but the best we can advise to you is by ferry. In this way you can reach the main arbour on the coast, visiting the hidden gems from a different point of view. From Molo Beverello there are many opportunities for you, all of them are different by price and typology. If you will opt for more stops by the way, your trip will take longer, but you could have the chance to see many places on the way to Amalfi. The website of the company that manage the track will better give you the updated prices. On the way to Amalfi, the ferry will stop to Positano. If you find something that take your attention you can stop, visit the place and take the next ferry to Amalfi. In summertime there are many trip from Napoli to Sorrento or Amalfi. During winter those are reduced to 3 for day. If you are still looking on how to get to Positano and Amalfi Coast from Napoli, we will suggest you to take it as a day trip. The journey for a single way will take you up to 2 hours. Stay overnight and be ready to be surprise by the nightlights and the moon reflecting on the sea. Planning a day trip from Napoli to Amalfi Coast, you need to bear in your mind that the travel will make you feel tired. If is in summer, the temperature will affect it as well. Our way to plan a day trip to Amalfi Coast is to make some stops on the way. Many of it could be Positano, Sorrento, Vico Equense or the smallest towns. In my personal opinion, I want to be in the position to make smallest day trips everyday. It will be not a relaxing holiday, an you could end up more tired than before. This is for us the best way to go from Napoli to Amalfi Coast. Taking a train from the main train Station of Napoli is the way to reach the Sorrentino Coast easy and cheap. If you are a budget traveller like us, you will love this option. Naples to Sorrento by Train is easy and fast. There is a train called Vesuviana. It is a special train that make a route through all the cities on the coast. As we have said before already, to reach Sorrento and the Amalfi Coast from Napoli, the easiest way is to take the Vesuviana. The price of the ticket is 4,50 euro and it cost of 1h and 10 minutes with the direct train. In fact, take attention to the kind of train you take. They may take longer if it is direct (signed with D after the train direction Towards) or super fast (DD signed). The difference is in the stations stop they do. The super fast doesn’t some train stops. This train will also take you to visit the ruins of Pompeii and Herculaneum. Ercolano – Napoli: € 2,20 (ticket zone U2). The kids under 1 metre don’t pay if accompanied by an adult, you can take with you as many luggage you want, it doesn’t cost you more. The prices and the tickets you have here are valid on the FS Trains as well, the national rail trains. If you want to seek further information you can visit www.unicocampania.it. The Vesuviana trains are crowded, especially in the summer period, so plan in advance your journey and be careful of your belongings, there are many pickpockets ready to take advantage of crowded places. On the way, you can reach easily the ruins of Herculaneum or the MAV Museum of Ercolano or hike the Vesuvius just stopping at Ercolano Scavi. You can visit Pompeii as well and the ruins, the best stop is at Pompei Scavi. We will highly suggest you to visit one of those two amazing places. For us the best ruins are the Herculaneum one, but the most famous are at Pompeii. 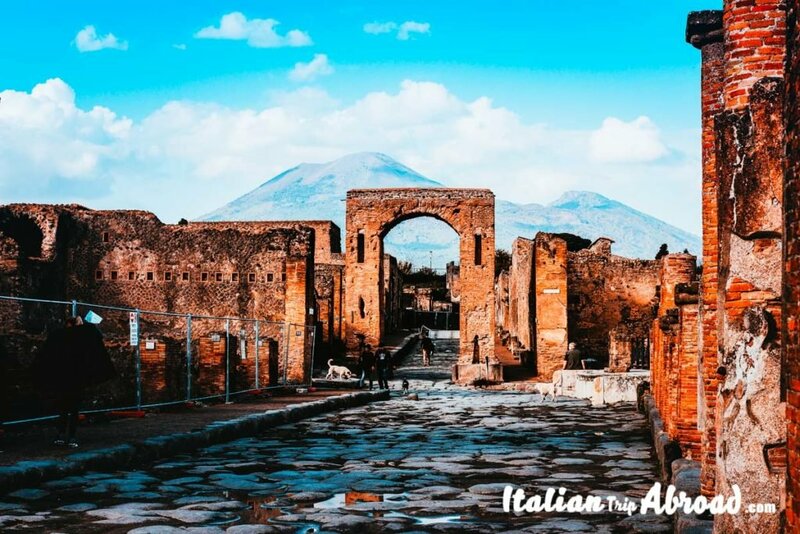 Plan a one day trip to Herculaneum or a visit to the Ruins of Pompei from Napoli. Take the Vesuviana from Napoli Piazza Garibaldi, toward Sorrento. The Vesuviana is a train doing all the internal part of the cities of the Gulf of Naples. It is the train line that the locals take for their transport from outside and inside the city. The Vesuviana is running just out of Naples and do just a couple of stops at the suburbs of the city. You can step off by the train at the famous ruins of Pompeii or at Herculaneum. If you are planning a week in Napoli and around, a visit to one of these places is highly suggested. Take advantage to stay in Naples and eat an amazing Pizza before your day trip to Positano. From Piazza Garibaldi, just downstairs, opposite to the main entrance go downstairs and turn left. You can buy the ticket to Sorrento at one of the machine before the entrance. Otherwise, there are many spots inside the station where you can easily buy a ticket. If you don’t find any, there are many shops, commonly called “Tabaccaio” that sell the tickets. The timetable with all the departure from Napoli Garibaldi and all the Vesuviana’s Stop. Due it is a step by step guide to how to reach the Amalfi Coast from Napoli, this is the middle point between the two cities. Arriving to Sorrento by train, it will stop you at the centre of the city. The Vesuviana Train station is located close to shops and other spots. It is a very touristic place with a lot of restaurants and hotels. It will also be a good place where stay a couple of days, and where to start some of your amazing day trips to the Amalfi Coast. From Sorrento train station you can bring the Sita Bus. It is a public transport company in the Campania Region.The Sorrento train station is not that big. Just going out of the station you can reach the bus stop to Amalfi city. There is a kiosk with the writing “Costiera Sita Sud” where you can buy your day ticket for 8 euro. There are many other options like if you want to stay longer, ask to the kiosk. On the bus, you can admire the amazing landscapes and views the Costiera is famous for. The ride from Sorrento to Positano will take about 50 minutes. It depends on the traffic. Especially in the summer this area is crowded. There are not just tourists, but it will be also full of locals. There is just one main way to reach Positano, with one carriage to go and return. If you are going in the pick time, there is no other chance that enjoy the view and carry a bottle of water with you. 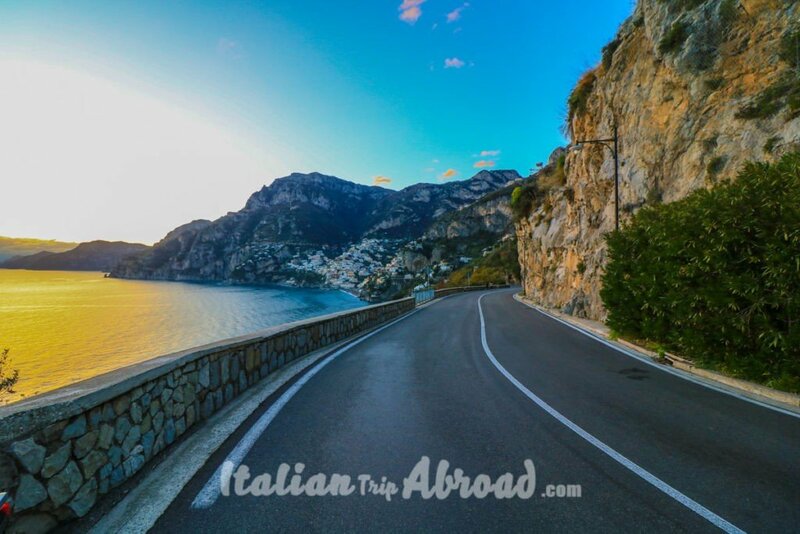 Tips: Be ready for tons the curve, the Amalfi Coast is full of it, but the drivers are really good. Take a seat on the right side of the bus, otherwise, you will miss everything. Explore Sorrento an underrated gem of Sorrentino Coast. Allow you a bit of time, to explore Sorrento and enjoy the good weather and the sea breeze. Sorrento is a nice place where do shopping. When you reach Positano you will know that because there are so many artistic boutiques on the way. Do you know the Costiera is known also for the artistic glass processing and colourful majolica? Yes, it is.Positano is a small town on the rock, the ancient streets and the breathtaking landscapes become famous in the golden age of Italy when the riches people choose Positano for their holidays. Still thinking if you want to do this trip, this is a full list of things to do in Positano. Today Positano is well known as one of the most beautiful and Instagrammable places on the Earth. It is noteworthy to have a picture of Positano on your profile. The blue of the sea unmistakable. The small and narrow streets will stick in your mind forever. The colours of the flowers and of the majolica are something really special. I you don’t know how to take the best instagrammable shots of Positano, we have some photography tips for you. If you are not a very fun of on the road trips, you can take a boat trip from Sorrento to Amalfi. This is a really popular route, so be sure that you will take your ticket in advance. The Vesuviana Stop is just behind the main Sorrento’s Square. Sorrento has some of the best beaches of the Napoli Goulf, explore it before take your ferry from Sorrento to Amalfi. 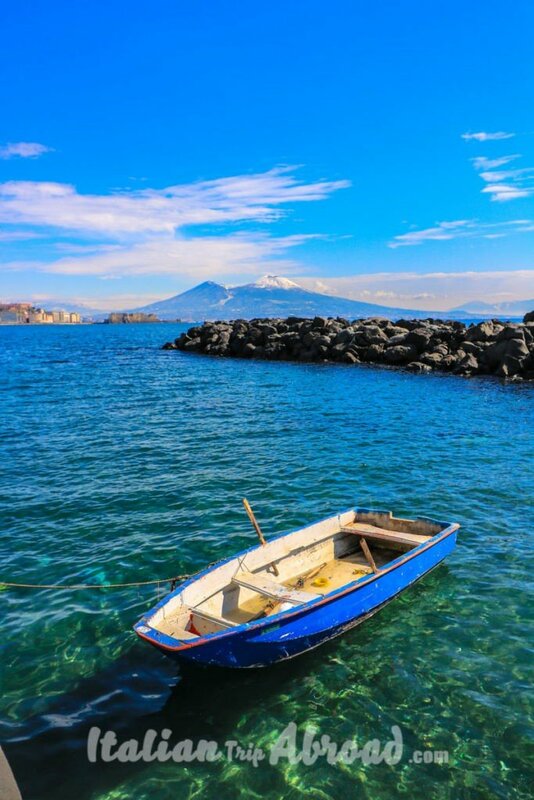 The big beach of Sorrento is really famous and you can take the boat to the main island of the Gulf. It is called Marina Grande and there are many restaurants really nice as well where have a lunch. It easy to reach the port of Sorrento. From Piazza Tasso, the main square of the city, you can walk down to the port. Here is the ferries that will arrive and leave from and to Naples as well. Book your Amalfi Coast mini Cruise, explore the Sorrentino Coast and some of the prettiest italian Islands.The trip will cost from less than 10 euro. I will suggest you visit also Sorrento, it is worthy to be visited on your stop to come back to Naples. I appreciate the thorough description of the transportation system. You even tell which side of the train to sit on and how to connect to ferries, etc. When I am ready to visit this area, I will have everything I need by reading your post. This is so helpful, that area can be super expensive to get to and get around in. Thanks for all the tips! Thank you, Jessica! Yes, it is true, this is is super expensive and can be really hard to have more than a week at the Amalfi Coast, but in the following weeks, we will get a new guide to how to afford the Amalfi Coast on budget. Stay tuned! Thankyou for the guide! 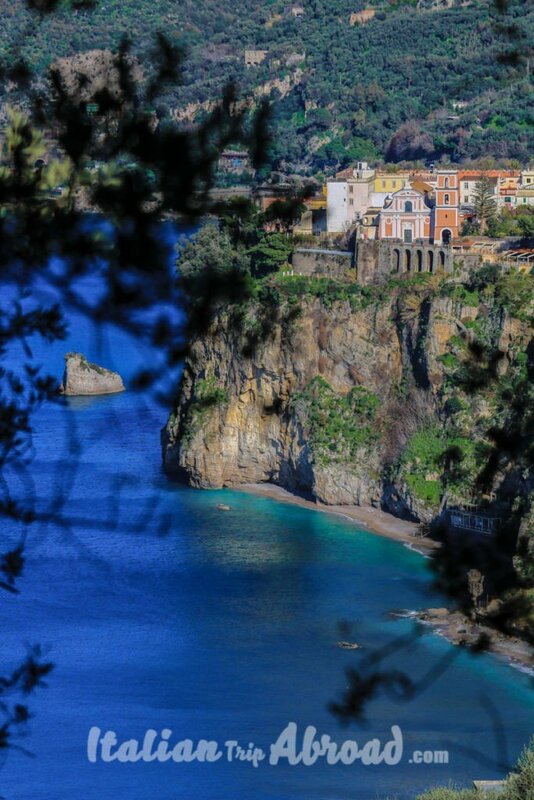 The amalfi coast looks beautiful! Yes it is awesome and worth to visit! thanks for your helpful tips! I’ve always wondered how to get to this part of Italy. I have yet to go here but I am so excited to see it one day! Ah, this is exactly what I needed. Planning a trip to this area next year. THANK YOU!! Well, happy to help. If you have any question more, be free to ask. Naples is my favorite part of Italy. Did you have a chance to try the most famous pizza? 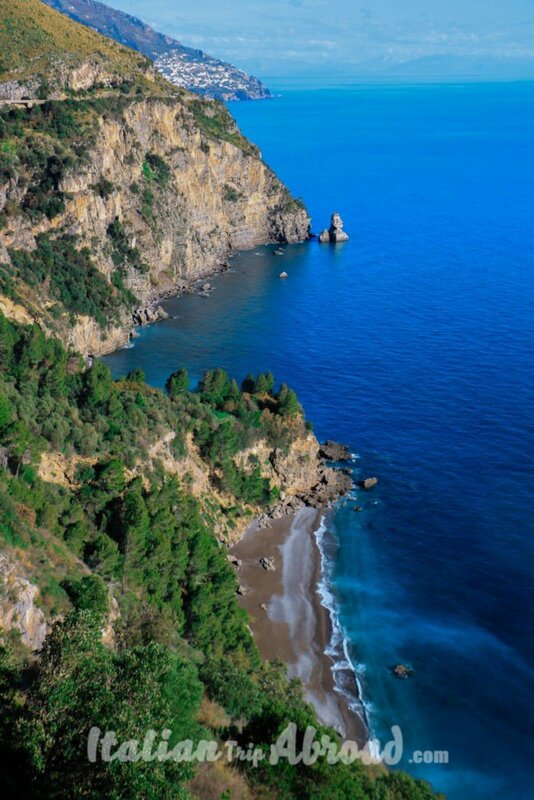 Almafi Coast is high on my list as I missed it during my Italy tour. I loved your detailed guide on use of public transport to reach Positano and Naples. I am saving it. Thanks, Yukti, nice to read you will save it and you love it. If you have anything else to ask, be free. This is such a detailed guide, very thoughtfully compiled. Thanks so much for taking the time to share this info, I feel like I’m ready to make the trek! This is great guide to share! Very descriptive and helpful to many I’m sure! I’d love to make it out there someday! Having taken this trip many times, good to know the information is the same. I quite like the SITA buses and you are right, it’s very curvy, but the drivers know what they are doing. And Sorrento is such a great place to base yourself. I spend nearly half the year in Italy, but haven’t made it to Positano yet! I loved reading this and found it useful, grazie! I haven’t been to Italy since I was a very small child. From that gorgeous blue water to the colorful houses built into the side out the mountain, how gorgeous! Definitely two MUST destinations in Italy. This post reminded me of one of my favorite and funniest travel stories. We took a local bus from Pompei trying to get to Amalfi, but there was a transfer somewhere in there and one bus dropped us off (supposedly) 400 meters to where the other was meant to pick us up. Long story short, we found a magnificent Italian mama to hitchhike with, who just happened to own a hotel on the hilltop above Amalfi. Long story short, we made great friends, ate great food, and stayed in the region for 5 weeks instead of the 5 days we had planned ?Who knew it could be so easy to have caught the bus there? I would love to visit Italy and its beautiful cities ! Such gorgeous architecture and amazing pics opportunities !